Spirit, lightness, clarity – which instrument would be better suited to embody these French cardinal virtues than the flute? And when five highly decorated instrumentalists (four ladies and a gentleman) also come together to bind a colourful bouquet of French flowers, Monet’s poppy fields or Cézanne’s whirring summer landscapes appear before the inner eye of the listener already with the first notes. 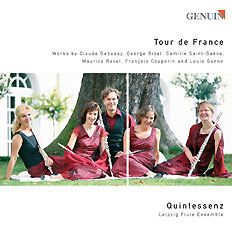 The name of the Leipzig flute ensemble is Quintessenz, playing for the most part their own adaptations of classics such as Saint-Saens’ “Carnival of the Animals” and Bizet’s “Children’s Games” on their first GENUIN CD. But not only are these genre pictures, rather intimate in their original versions as well, precisely and delicately whispered. Works originally conceived for large ensembles, such as “Alborada del Gracioso” and the “Afternoon of a Faun” resonate with such beauty and fullness of sound that one does not miss the symphony orchestra – on the contrary! Read the review published by Pan flute.